This is a BIT Cache. This is a laminated tag, similiar in size and appearance to a Munzee. There is a sample Picture of a BIT Cache below in the "Pictures" section of this cache page. The Harpersfield Covered Bridge was built in 1868 (renovated 1991-1992), and spans the Grand River, in Harpersfield Township, Ashtabula County, Ohio. 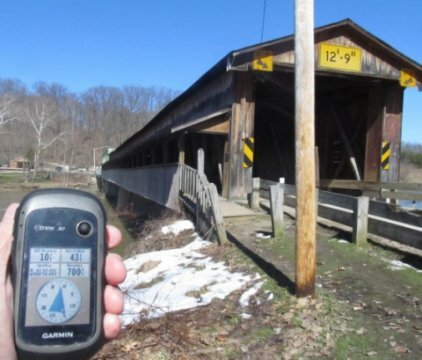 At 228 feet long, it is the third longest covered bridge in Ohio, despite an "old" historical marker on site (picture below) that touts it as the longest in the State. The same historical marker explains the somewhat strange combination of the Harpersfield Covered Bridge with an attached 140 foot long Steel Truss Bridge. The original Northern approach of the covered bridge was washed out during the great flood of 1913, resulting in the course of the River being altered. 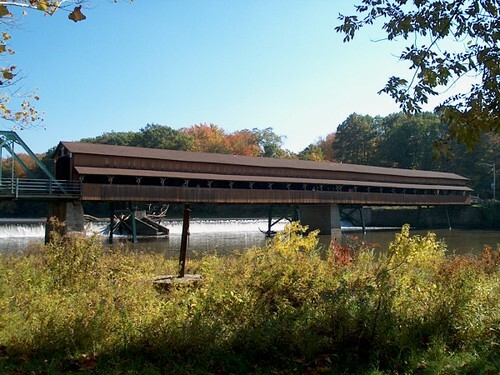 The Harpersfield Covered Bridge Metropark encompasses land on both sides of the River, and there is ample parking on both sides, although the cache itself is located on the South Side. Alternative Geocaching website afficienados should note that the bridge is listed as a virtual cache on Terracaching.com, with it's logging password located 25 feet from this BIT Cache. A very detailed hint, and spoiler photo have been provided, should you need them. Enjoy your visit, you will not be disappointed in the bridge itself, or the adjoining Metropark. Arne gur Fbhgu raq bs gur oevqtr, nybat gur crqrfgevna jnyxjnl. Whfg orsber 2aq iregvpny fhccbeg ornz, gur pnpur vf haqrearngu gur obggbz ubevmbagny ornz. Frr fcbvyre cvp. Lbh JVYY unir gb trg qbja naq qvegl gb frr guvf OVG naq vg'f ybttvat cnffjbeq, vg fvgf nobhg 6 vapurf nobir gur jbbqra jnyxjnl. What a great location for a BIT cache! We just happened to be in the area today and got off of the interstate to grab this cache that has been lonely for far too long. Made the find, then spent some time just enjoying the superb scenery at this place. We had no idea that these parks were here and might never have discovered it if not for this OC. Many thanks! Visiting the covered bridge, we decided to grab the cache while we where here. This is another of my favorite places close to home. I even held a geocaching event here once. There were people still walking on the bridge but my husband and just waited until they crossed to make our find. Another nice find. Thank you Mr.Yuck. Took a drive down to Cleveland over the weekend to see my Indians lose twice. I hadn't planned on coming here but I was gently persuaded by the CO to stop by on my way home. I was hesitant, not knowing if I had enough time and if it would be worthwhile. Boy am I glad I did though! This was an extremely cool place to explore and well worth the very short drive off the highway to get to. I think I walked back and forth across it 4 times. Lots of people hanging out and watching other fish down in the river too. So when the coast was clear I made my move to get the required code. Then of course I had to drive across once. Excellent find Yuck-man! Thanks for bringing me here.